We’re asking students to recommend books from our collection, books that inspire and provoke and amuse. First up is our astute library assistant and MFA student, Sarah Stoss. In a blend of science fiction, psychological realism, and poetic prose, Carmen Maria Machado has created a work of abstract art. This short story collection will leave you reading and rereading and wondering, “Well, what did that mean?” Each story centers around a woman’s body but in unique ways, and you may leave the stories thinking one thing, while someone else may leave thinking something completely different. The up-for-interpretation aspect of this collection is part of its beauty. 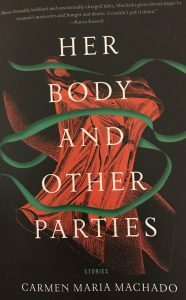 One story is about a woman who can’t let go of the green ribbon tied around her neck, a symbol for something or nothing; it depends on how deep into the Machado world you’d like to go. Another is a list of all the sexual encounters a woman has had throughout her life, and another a list of Law and Order: SVU episodes that are bizarrely reinterpreted, but at the same time telling of the issues that lie on the surface of the real show. And my favorite is “Real Woman Have Bodies,” a story in which women are literally becoming invisible and being stitched into dresses. Machado addresses issues of starvation, sexual orientation, and the double standard between men and women when it comes to egos and art. If you’re looking for a book that will get you thinking, or if you happen to love Law and Order: SVU, this collection is worth the read.